When you’re busy in the kitchen, there’s usually a lot of pacing back and forth between the worktop and the bin. Our large kitchen waste bins cut down on the footwork. It opens immediately and automatically on approach and closes once you have moved away. No need to move in front of the bin to operate a pedal. Just wave the sensor bin open from anywhere within reach. It’s a smarter, easier way to throw away waste rubbish. An ingenious design, the flat slim rectangular shape allows the bin to snug against any kitchen cabinets, end of an island or simply free standing. No matter where the Autobin is placed it looks premium and elegant in any room. If there’s one thing we don’t like doing, it’s touching waste bins. The touch-free technology prevents a lot of this, making waste disposal quicker, easier and more hygienic. No more searching for the pedal to step on, everything is hands-free. All you need to do is place your hand or the rubbish in the sensor range within 20cm of the soft close ergonomic black plastic lid and it will automatically open, and then seconds later automatically close. The great thing about the Eko large kitchen waste bins is that it has a digital touchscreen with a manual override open/close feature, furthermore it has a digital count down hence you are fully aware how the lid is going to react. Now our new 2017 models of large kitchen waste bins are designed with a deodorizer compartment holder, the activated charcoal filters help to absorb, neutralize and reduce unpleasant odours in waste bins for up to 8 weeks depending on temperature, waste material, and humidity. This is on the inner side of the sensor bin lid. Battery life is good, Eko states that 6 AA alkaline batteries should last up to 14 months, that’s about 20’000 cycles. 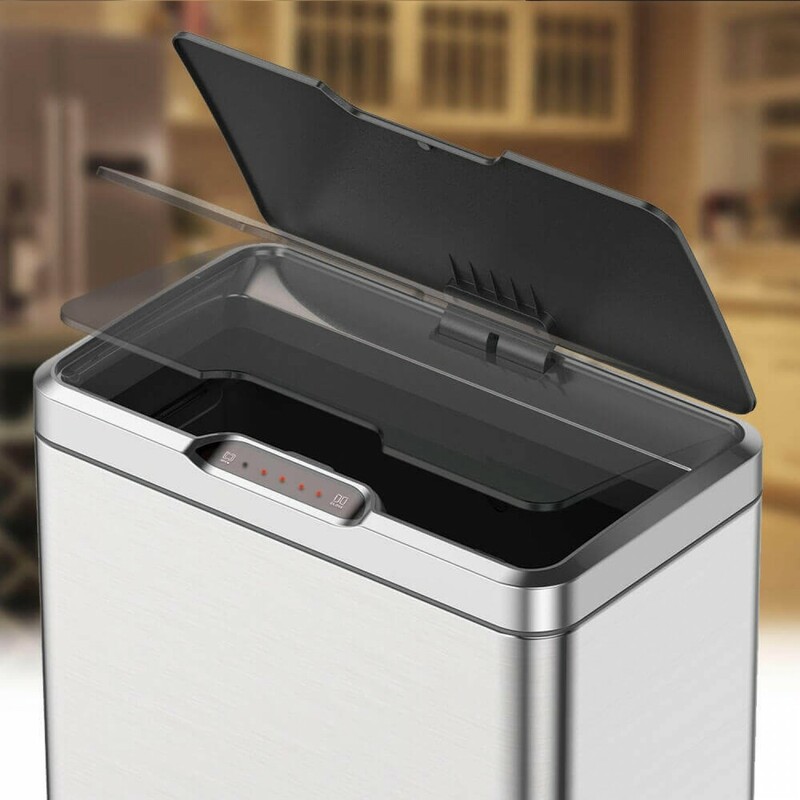 With its sleek finger print resistant brushed stainless steel matte finish and non-skid black plastic base; this waste bin is perfect for any kitchen. The bin bag is simple to change; The plastic bag stabiliser insert will keep the bag safe and secure and neat and tidy by hiding any excess bag. The removable rim is easy to lift off for quick and easy replacement of the plastic bag, whilst the large 80-litre capacity means you won't need to empty it as often. It's clean, convenient, and smart. 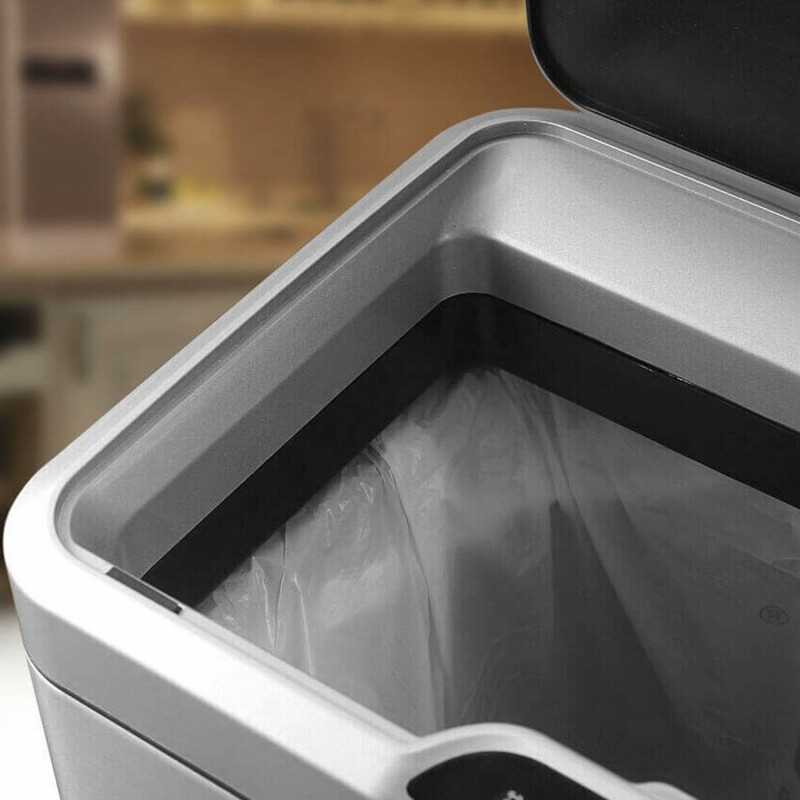 Throwing away your rubbish will be quicker, easier and more hygienic with this EKO 80 Litre Capacity Rectangular Motion Sensor Waste Bin. 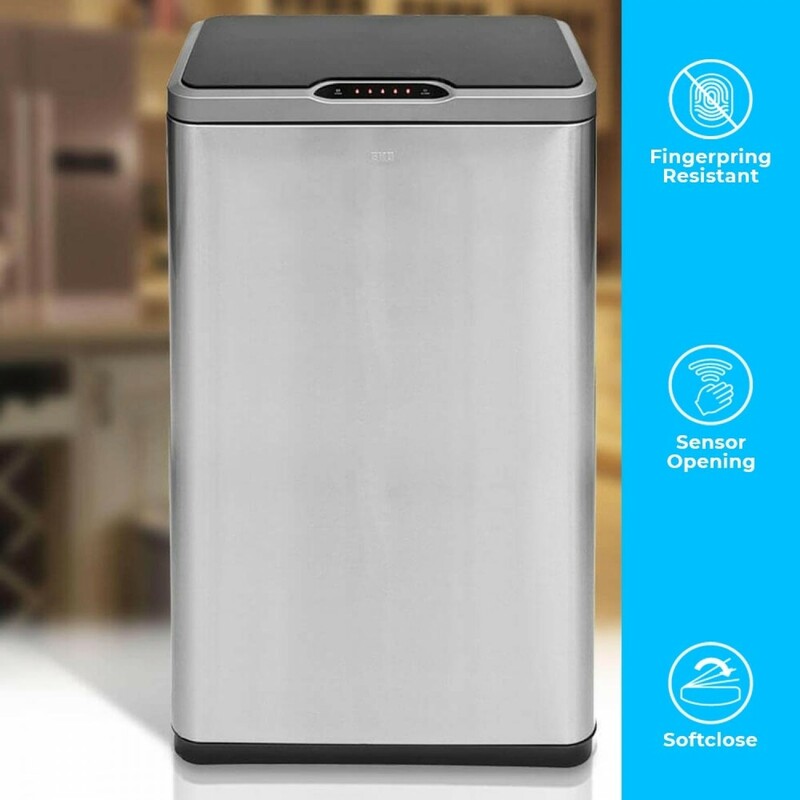 This Mirage automatic large kitchen waste bins streamline waste management, so your home and office stay clean with less effort.